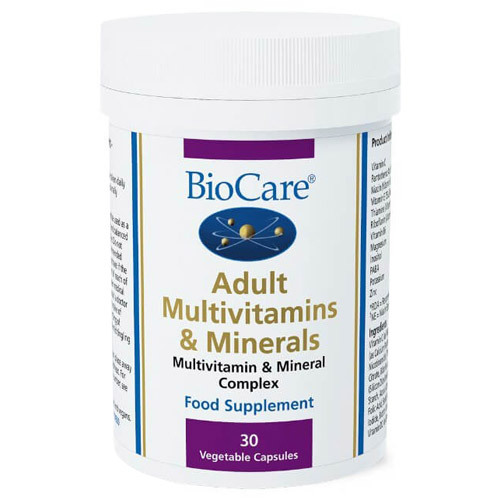 BioCare`s Adult Multivitamins & Minerals is a once daily formulation for adults providing great all-round nutritional support. It contains nutrients in their most bioavailable forms, such as mineral ascorbates and citrates, chromium as picolinate, selenium as l-selenomethionine, and vitamin B6 as pyridoxal-5-phosphate. This formulation is in a capsule for easy swallowing and is iron and copper free. Vitamin C (as Magnesium Ascorbate), Capsule Shell (hypromellose), Pantothenic Acid (as Calcium Pantothenate), Vitamin E (as D-Alpha Tocopheryl Acetate1), Silicon Dioxide, Niacin (as Nicotinamide), Thiamine (as Thiamine Hydrochloride), Calcium Citrate, Magnesium Citrate, Zinc Citrate, Riboflavin, Vitamin B6 (as Pyridoxal-5-Phosphate), Potassium Citrate, Anti-Caking Agents (Silicon Dioxide & Magnesium Stearate), Inositol, Dicalcium Phosphate, PABA, Modified Tapioca Starch, Acacia Gum, Manganese Citrate, Sunflower Oil, Chromium Picolinate, Sucrose, Corn Starch, Folic Acid, Sodium Molybdate, Vitamin A (as Retinyl Palmitate), L-Selenomethionine, Potassium Iodide, Biotin, Vitamin B12 (as Hydroxycobalamin), Antioxidant (Natural Mixed Tocopherols1), Vitamin D2 (as Ergocalciferol). Take 1 vegicap daily with food or as professionally directed. Below are reviews of Adult Multivitamins & Minerals - 30 Vegicaps by bodykind customers. If you have tried this product we'd love to hear what you think so please leave a review. I haven't had a cold since taking these tablets, which is quite remarkable as I used to get 2 or 3 a year. 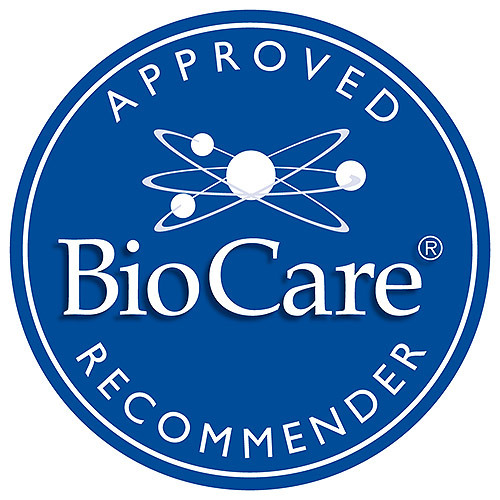 Been taking these for years - I am sure they have contributed to my hardly ever catching colds or getting ill. Good price and quick delivery from BodyKind. Excellent daily Multivitamins & Minerals which I would strongly recommend. Speedy & efficient service by Bodykind. These vitamins give me noticeably MORE energy. I'd stopped taking them for awhile earlier this year and then started again because I was feeling a bit blah with a distinct lack of oomph. I know that the 'B' Vitamins in any formula can help with this and sure enough within a week of taking them again my energy levels were massively improved. For me these really are my baseline product.